We decided to spend this Hari Raya holiday here in Shorea this year. What a mistake! For the price we paid.. we might have as well gone to Tanjung Jara. BTW, we forked out 10k for the whole villa. The pool was murky. Make sure the kids are no where near the shallow pool and its sharp edges. The wooden flooring which looked pristine in pictures, need serious repairing. On d 2nd floor, where single beds are placed against the windows.. the windows cannot be locked. If u or yr kids are rough sleepers.. plz pull d mattress to d floor. Bcoz of the steep stairs to the hotel from where u leave d car.. leave any handicapped family members at home. The nightmare got worse tonite as i write this.. place attacked by wasp.. a call to the management and the advice was- to off all the lights. In d middle of the jungle and total darkness. Great..but it is also a smart way to save on electricity bill, no? Since already there is not a single air-condition and no tv .. fine since its marketed as eco-resort? But shouldn’t cleanliness at least also be impeccable? And oh, btw, by 1am, every single one of the staffers leaves the hotel ground for home. In case of an emergency.. they say they will come by.. hopefully soon enough to unlock the gates ( which btw u can enter from the sides) and get yr car outta there. There are no locks to d doors of d hotel and rooms that if someone breaks into the hotel ground we hope they would stop at our cars parked in d darkness downstairs. My nephew got stung just now.. when we called d staff who was preparing to go home, she said she had just attended to two other kids in Shorea Estate, next door who also suffered the same. For goodness sake d windows and d many many airholes should at least have nettings. Tonite, we sleep hearing em insects flying around and praying hard we dont get stung. Kids slept off crying in fear. I am thankful they are asleep by the time the lizards come out to occupy the ceiling above the bed. That explains d the litters on d bed netting. I wont dwell on the green mould by the poll for fear of sounding petty. All in all.. to me and my family-this place is a death trap. Other than Trip Advisor where comments are genuine.. a lot of what u read are praises. I’m beginning to think it’s d shorea owners themselves who wrote them simply because its impossible to feel that way if u had stayed here. By the way, be careful with yr back when u attempt to use the bidet after doing yr business as it is behind u and right at d bottom. We spoke to the staff who all seem to be aware of all the problems we had with this place. The owners they said, had been told many times of guests’ feedback, especially of d existing dangers. But they seem not to be bothered, according to the staff. Not d locks, not security issues, d broken flooring, not d wasp problem. In case health security is huge to u.. u must know that d water supply is also sourced from d river. They have a filter though. Just not sure how it works for leptospirosis, if the threat is there. The so-called infinity pool which looks inviting in pictures-If yr kid pulls himself up, he falls right down from two floors. But hey! since they get full bookings half the time, why shud they bother bucking up right? Staffers say guests are never repeat customers.. most of them were like us who were floored by the reviews i believe are fake with the nice pictures with orange lighting and what not. To illustrate how they dont give a damn…d queen size bed btw has a round mosquito net above which if u try to use.. it covers u from d waist right up to yr face. Just how idiotic can they be. I see here Shorea apologising and promising guests the next time around it would be better. I read the one in Feb. This is July.. so u think? WE HATE THIS PLACE AND WISH WE COULD GET OUR MONEY BACK! We should have known when we arrived at the gate. This was supposed to be a time for us busy people to unwind. These pictures i attach are the real deal. Earlier today, we left d place to take a breather and saw this one sign.. it all makes sense now. Here is a little summary of the on-going saga between residents and resort operators, played out on Pantai Hills Orchard Resort. We hope that – you – visitors – tourists – authorities – friends – families – workers may benefit from this information – and make informed choices to help this beleaguered community. Pantai Hill Orchard Resort – born in the early 1990’s, was originally a ‘Homestead’ concept for private home owners. Today, the developers of this project – Intermewah Development Sdn Bhd no longer performs its responsibilities and has conveniently and discreetly exited the scene. They are still selling remaining land on Pantai Hills via a connected entity called SK Brothers. In their eagerness to sell their remaining land, they have turned a blind eye and contravened the very sale & purchase agreement and the accompanying schedules we all signed on – in good faith – when we purchased our ‘Homestead’ lots. So now, far from being a ‘Homestead’ concept, Pantai Hills Orchard Resort has become a haven for – unregulated resort operations. Since 2011, five new private resort operators have mushroomed on the hill. Initially the presence of resorts on the hill had little impact on the lives of private residents. We were friends with healthy neighbourly exchanges. As the popularity of the resorts grew – spurring expansions, it further taxed the shared resources and surrounding environment. This was when our neighbourly relationship began to change. Vandalism against residents have also increased in aggressiveness recently. All of our signages by the entrance gate were ripped out the very day it was installed. <<read about it here>> No words, no communication, just heavy handed bulldozing. What kind of civil society do we live in? We collect spring water from a hill source, free for all to use. For 3-5 months in the year it is dry with little rain. Due to the gravity water system piping, resorts located at the top draws the already low volume of water, into their numerous water tanks during such periods of drought – depriving residents below of needed water. To further exacerbate the matter, several resorts have independently pulled their own private lines from the same spring source for themselves, depriving residents of this scarce resource. This ugly fight has become a free-for-all resource grabbing. Low water levels also promote higher bacteria presence in the water, being close to the sludge at the bottom of the main water tank, uncleaned for perhaps the last 15 years. A compromise for less visitors during this period was not negotiable (except **theDusun), no offered solutions, no communication and residents suffer at the expense of resort profit making. Despite this, resort expansion continues. Several resorts have failed to control their noise emissions and have regularly affected their neighbours. Bookings of large groups to celebrate occasions have proven to be unsuitable for resorts operating from small land areas of 1 acre or with neighbours sharing a boundary. Parking spills over onto common roads, narrow roads become hazardous, narcotics and prostitution issues changes hill serenity. Unscrupulous resort operators continue their obnoxious and selfish behaviour. Meanwhile, resort expansion continues. Rubbish – many bags strewn along the beautiful road leading up to the gates. Food wrappers and other accumulated construction material, thrashed everywhere by the entrance and road side. Toxic building materials dumped by the slopes of the river. Use of weed killers, food waste, noise and bright lights from over-lighting at night affects the surrounding natural habitat of wildlife, pollination and the earth we plant our food from. Meanwhile, resort expansion continues. Open burning. Recent flash fires were a wakeup call. Still neighbours, construction workers and some resorts do not recognise this danger. Narrow roads leading up to the gates have increased in danger due to the heavier traffic created by resorts. Meanwhile, resort expansion continues. The National land Code, the Sale & Purchase agreement on – non commercial use of agriculture land and size of structures have been contravened. The environmental act on noise, water & health have been compromised. State water and health department regulations broken. Unregulated resort operations and the careless degradation of our national forest reserves all add to drown this priceless venue. Meanwhile, resort expansion continues. We have all seen this kind of business operations before. A popular tourist destination, destroyed by over eager businesses with selfish and short term visions. Eventually a beautiful venue and a national treasure, becomes over built, used and decimated – sucked dry with only a fraction of its wonder left to enjoy. Residents have the right to protect – a comfortable and serene livelihood on Pantai Hills that is fair to all parties concerned. It is sad that we have to fight for it – tooth & nail in an environment of educated higher-middle class Malaysians. Scums, cheats, robbers, egos, profit and lack of empathy are stubborn and ugly traits some resort operators struggle with, in-fact we all do in our journey of life. We have observed this phenomenon happen all over the world, in varying degrees. Not because its an inevitable human trait. But more so because of the system and the social & environmental influences we all grow up in. This heavily shapes our code of conduct and response to the outside world. We respect the ambitions of resort operators. So, in the hope that we can perhaps flourish together, lets consider this. 1. Show that they are concerned about correcting old tourism business models that leave a trail of destruction & depletion of our country’s natural resources. 2. Show that they are progressive, by supporting ‘real’ sustainable tourism models – making Pantai Hills a pilot project for sustainable tourism in Negeri Sembilan and eventually Malaysia. 3. Show that they understand the new generation of tourists and how an experiential/caring/inclusive business model works out better in the long-term. One that enriches all Malaysians and not only businesses. 4. Become a leader in sustainable tourism models that can then be replicated throughout Malaysia. Regulate resort operators on Pantai Hills and show Malaysians that the state of Negeri Sembilan proudly upholds state & national laws and runs a responsible & respectable administration for the benefit of civil society. Operates on 13 acres of land. Maintains hill tranquility with small group bookings. Operates on sustainable principals respected by residents. Always willing to work with residents to solve shared infrastructure problems and community issues. January, February, March & April seem to be the dry and hot months on Pantai Hill. The lack of rain coupled with seasonal strong winds during this period has increased the risk of bush fires. The recent bush fire at the entrance of Pantai Hill Orchard resort could be a result of indiscriminate disposal of cigarette butts or a flash bush fire from the intense heat on dry leaves. Open burning is dangerous especially during this period. Some construction/general workers are still practicing open burning daily on Pantai Hill. Caution is paramount because fires can spread very quickly and can be out of control, even if workers are looking over it. Pantai Hill Orchard Resort becomes a Toxic Dump Site Again! Toxic asbestos roofing, dumped near the stream, nearby Pantai Hill Orchard Resort gates. Yet again, Pantai Hill Orchard Resort’s own popularity is contributing to its own demise. The surge in outside visitors has made this place less safe and inundated with more rubbish. The latest is another toxic dump of asbestos by unscrupulous individuals or contractors. Why dump at a clean place when they could have easily taken it to the usual ‘illegal dump-site’ further down? Such acts contaminate the entire stream unnecessarily, bringing toxic materials previously contained within a small stretch of the river to now – almost the entire river, reaching the water treatment plant. Areas where visitors can enjoy the freshness of the stream without having to trek into the jungle have become less and less. Over the Chinese New Year period, another 2 big signs previously put up at the Pantai Hill Orchard Resort main entrance – was ripped off and taken down completely. What can we say. It has gotten to a point where some gangsters are flexing their muscles – over the control of Pantai Hill Orchard Resort. Obviously these gangsters are working together with the absent developer and in tandem with some resort operators, forcefully trying to stem all resident voices with threat of – violence & aggression. Pantaihillwatch.org Signage ripped and thrown away. As the world becomes increasingly hostile, unstable and dangerous in 2016, so does Pantai Hill Orchard Resort…or so it seems. In the month of January – already, vandals with an objective to prevent the truth about the situation on Pantai Hill Orchard Resort have struck with – aggression and vengeance. This new signage at the gate of Pantai Hill Orchard Resort was ripped out – 4 times in 6 days. A recent sign put up by concerned residents was repeatedly taken down (4 times). This sign, a warning to visitors about the state of things, zooming in on issues like – insufficient and untreated water, safety, noise, illegal operations and the lack of empathy from (the majority of) resort operators – in not wanting to work with residents to solve it. Residents are angry. Just natural…isn’t it? This new signage at the gate of Pantai Hill Orchard Resort was ripped up and thrown into the jungle. Another time the signage ripped up and thrown on the fence. Many happy and unfortunate events have come and passed on Pantai Hill Resort in 2015. Sadly, the conflict of legality and neighbourliness between residents and resort operators have continued unabated. What a terrific game we are playing. Just like the games our nation plays with its citizens and just like the game globalists play with nation states. DECEPTION>EGO>POWER>MONEY>OPPRESSION… imposing personal goals onto others without empathy. Well….regardless of such behaviour – Pantai Hill Watch would like to send a message of LOVE and UNITY to all. 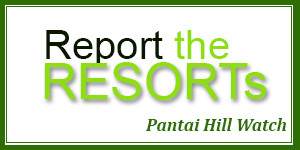 We would like to wish the best to – resort operators, visitors and residents of Pantai Hill. In all your endeavours and challenges in the year ahead. Our society is morally sick. Due to exaggerated value placed on individualism and materialism, most people are driven to pursue their own desires at whatever cost. Needless to say, this causes conflict and suffering to others, and to the planet — and yet many people are not even aware that this is not an intelligent strategy in the pursuit of their own personal happiness, much less the success of a society. This situation is like if every cell in your body decides to act on its own, and consume as much nutrients and energy as it can – even more than it needs. Soon some parts of your body will get sick, and that will damage the health of the whole body – including that of those greedy cells.